Returning to the heart of her beloved Cornwall, Kate Ryder weaves another deliciously irresistible tale of desire, jealousy and the search for understanding, set against the stunning backdrop of the glorious Lizard Peninsula. Cara and Oliver face the agonising choice between following expectations, or following their hearts. How will their story end...? Love the way the tangled web evolved. Each chapter has its own unique feature that links to the next. Am looking forward to reading more from this author. A Glorious Sequel - First-Class Read! Cara Penhaligon is a gifted Cornish artist whose talent provides her with the ability to raise and care for her three children. As a single parent, Cara has loved and lost not once but twice in her life and is finding an inner strength to carry on and spread her wings in the art world. Will taking new opportunities and uprooting her family be the fresh start they all need - and could she bear to live anywhere else but on the wild and beautiful coast of Cornwall? Oliver Foxley is a very talented and good-looking actor with a wife and four children, but since spending a summer in that same county his life seems to be lacking something. Can he live out his life knowing he's missing out on real happiness? First up, confession time; it wasn't until I began reading this novel that I realised it was a sequel! Having enjoyed Summer in a Cornish Cove so much, I added this one to my list purely on the basis of the author's name. What a lovely surprise! 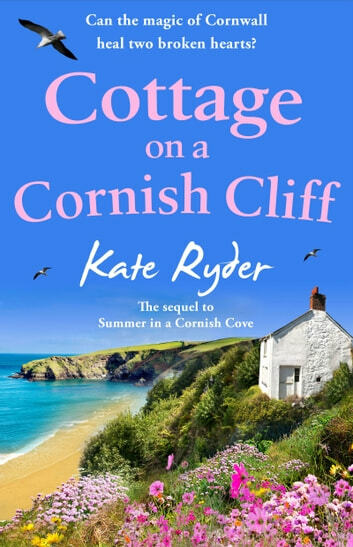 How rewarding to return to the spectacular Cornish scenery which Kate Ryder describes so aptly that I swear I could smell the sea... I have revelled in this book; everything about it is just so delicious. The characters are a mixed bunch, all with their own lives and idiosyncrasies and I felt I had been living in among them as I read. Every time I read a story set in Cornwall I have ideas about living there, but none so much as with this series. Full of angst, doubt, happiness and sadness this is one which captivates both heart and soul and until the last few pages I was never sure of exactly where it was heading. An absolutely glorious sequel, deserving no less than five super-shiny, sparkling stars! The setting and opposing cultures were wonderfully portayed. The accuracy of Cornish life and ways brought back happy memories of my life in the most beautiful county in the UK. I love novels about Cornwall as you can feel the sense of being there whilst reading. Lovely story beautifully told about relationships with family, friends, lovers and pets. The location was a character in itself. I was intrigued by the way this was written. The place was as much a character as the people. I enjoyed the story and cried a few times. Thanks to NetGalley for my copy.